A major chocolatier says it has created the first new variety of chocolate in 80 years. Behold, ruby chocolate. Barry Callebaut, one the world’s leading manufacturers of high-quality chocolate and cocoa products, debuted the new variety today at an exclusive launch event in Shanghai, China to a panel of tasters and experts. Named for its reddish-pink hue, the variety is being touted as the fourth-ever type of chocolate, alongside dark, milk, and white. Ruby would be the first new type since food scientists developed white chocolate (which isn't exactly chocolate) 80 years ago. In a press release spokespeople for Barry Callebaut said, the “chocolate meets a consumer need no chocolate ever did before.” Made from red cocoa powder derived from the ruby cocoa bean, the new iteration is said to possess “berry-fruitiness and luscious smoothness,” providing chocoholics “intense sensorial delight.” According to The Sun, Angus Kennedy of Kennedy’s Confection magazine called the unique variety, “refreshing, light and fruity.” Those aren’t adjectives we’used to hearing describe chocolate, so we're certainly curious. The fruity flavor notes require no artificial berry flavoring or red coloring. The Barry Callebaut Group is headquartered in Switzerland and is the result of a merger between Belgian chocolate maker Callebaut and French chocolate producer Cacao Barry in 1998. Scientists worked on the ruby project for over ten years and the confection underwent extensive consumer research by independent global research agencies Haystack and Ipsos in Britain, the U.S., Japan, and China. Peter Boone, Barry Callebaut’s Chief Innovation & Quality Officer suspects the cutting-edge cocoa product will satisfy today's love of “hedonist indulgence.” And as a trendy bonus: It's millennial pink-friendly. 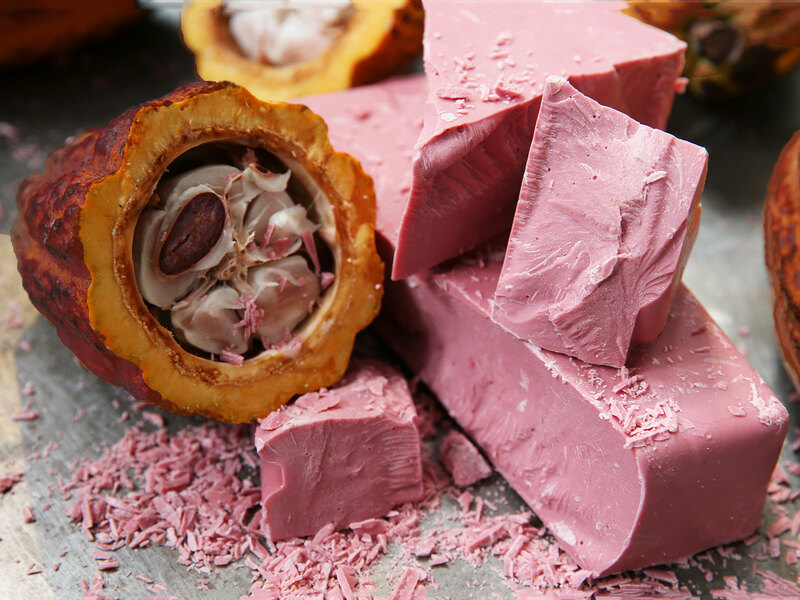 With its characteristic hue, ruby chocolate has great potential to become an ingredient in a host of new-and-improved snacks. We can already see ruby mochas joining pink Kit Kats and M&M's. Not to mention how ruby chocolate will be a total game-changer for Valentine's Day treats.